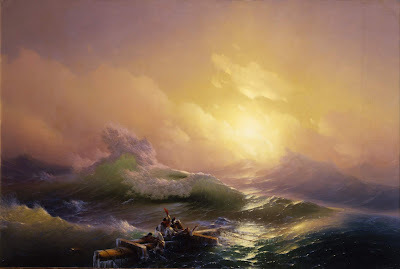 "The Ninth Wave," by Ivan Aivazovsky, 1850, his most famous work. The Ninth Wave is a sailing reference to a wave of unsurvivable power coming upon sailors after a series of increasingly larger ones. The painting shows the sea after a night storm and people facing death attempting to save themselves by clinging to debris from their wrecked ship (the world or a life). The cross always remains after any devastation in our lives. It reminds all that no matter the harm looming over us, there is Thanksgiving and peace with Christ. The painting has warm tones, which reduce the sea's apparent menacing size and as the wave nears the people it lessens in height, revealing the promise of salvation. The painting puts into the correct perspective the truth that all power in this life and hereafter is in the hand of a merciful God. Click HERE for the high resolution version. Thursday, November 22, 2018, a Mass of Thanksgiving will be celebrated at 10:00 am. All are welcome. There will not be a 12:00 pm Mass.